Propagation of the Faith Boston: HCA Members: No Summer Break From Sacrifice! HCA Members: No Summer Break From Sacrifice! During the summer, school children take a break from the usual routine of reading, writing and arithmetic; Holy Childhood Association members, however, never slack off! There is always a way to be thinking of and praying for other children in the missions who are not as materially and spiritually blessed as we are. A perfect example of this is the students at Blessed Kateri Tekakwitha Parish in Plymouth, MA. Members of the Holy Childhood Association since 2008, the children in the religious education program have prayed and offered sacrifices for their brothers and sisters in Christ in so many ways. This summer, through the leadership of their DRE, Joyce Hokanson, these HCA members reached out to their mission counterparts, while helping one of their own to grow in his own faith formation. Alex Heil, a new relatively parishioner (and an HCA member since he was born into it in 1992!) 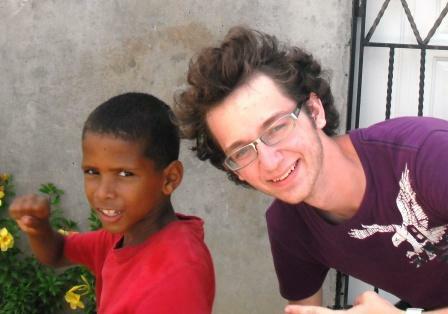 was about to make a mission trip to the rural village of El Factor in the Dominican Republic. While there, Alex and his team of teens would be helping to run Vacation Bible Camps for children, teaching songs, making crafts and, most importantly, letting the children know that because Jesus loves them, the teens do too. 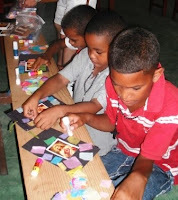 As part of their commitment to the missions, the Blessed Kateri students swung into action and collected fifty pounds of school supplies for the children of El Factor; there were glue sticks, markers, crayons, colored paper, rulers, and pencils – everything necessary to make glorious God-centered crafts. And what creations they made! As Alex and his team visited different parishes, the children were very happy as mosaics were made, glitter was glued to paper and a great time was had by all. They loved the attention of the visit, the gifts of all the craft supplies, but mostly, it touched them all to understand that hundreds of miles away in a place called Plymouth, Massachusetts, children were praying for them. As a new school year begins, we pray that ALL children may come to feel the happiness that Alex, his team, the children of El Factor and the Holy Childhood Association members at Blessed Kateri experience every day because they know that Jesus loves them.